After taking a quick trip to the Goodwill Outlet store I found the final piece of the puzzle. 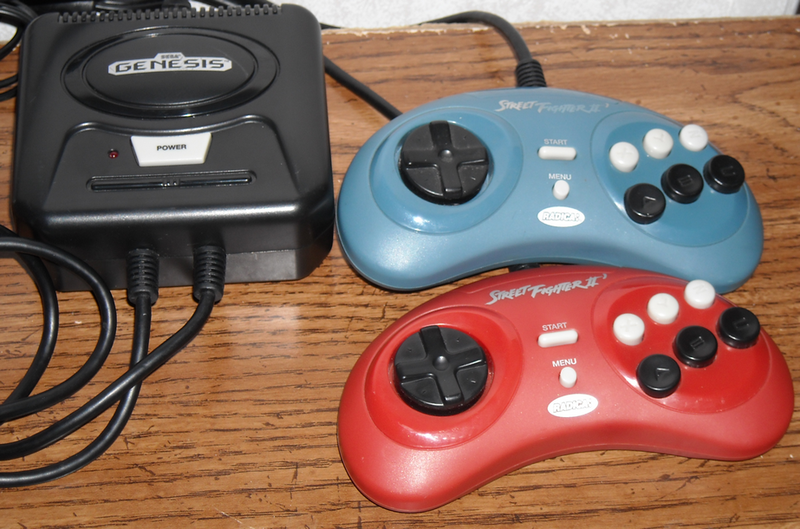 Yes, I finally found the last Radica Sega Genesis Plug n Play for my collection, unless I find out they made more. This one varies from all the rest in a few ways, but in more functional ways than the OutRun 2019 I reviewed last time. 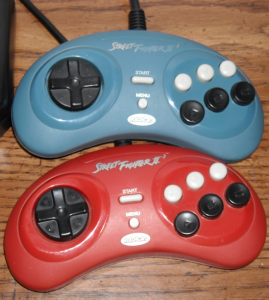 Firstly you will notice the two controllers sticking out of the system, instead of just one, as well as the Street Fighter II logo adorning both controllers. Radica decided to save space by using the smaller (model 2) style Genesis controllers, player 1 in red and player 2 in blue. But this time Radica gave us both Street Fighter II and Ghouls and Ghosts, two games that offer a 2 player mode and make full use of having two controllers hardwired to the system. But soon after putting the controller in my hands, I immediately had a pair of problems. The first is the blatant fact that these controllers are obviously smaller than the Genesis controller of this shape; they’re comfortable don’t get me wrong, they’re just smaller. The second is a major issue I’ve voiced many times with Famiclones, and other systems alike, that put the Menu/Reset button right where I expect the Start button to be. Although placed slightly below the actual Start button, in a hurry to get the phone, take a bathroom break or even just simply not paying attention this is TOO CLOSE to the Start button to avoid! And not only that, but both controllers have a Menu botton, this means either player can accidentally hit the Menu button and screw up a whole game. Perhaps Radica should have made use of where the Mode button on the Genesis controller was for their Menu button, but its too late to complain about it now. Radica did an ok job on these little systems, but I have seen modders take a crack at them and add cartridge slots, enabling them to play almost any Genesis cartridge (I assume they become essentially a Genesis 3). As these systems are pretty much a Genesis on a Chip (Genechip? Take that and use it freely, just remember where you learned it!) 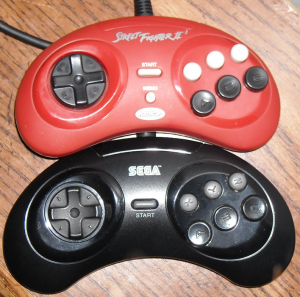 this particular system would be the best one to modify, having 2 controllers. But with how plentiful the Genesis 2, the system these are modeled after, are on the market, you’re better off with the real thing. I won’t go into any detail about Street Fighter II or Ghouls n Ghosts, as I’m sure we’re all fairly familiar with these games by now. I will however say that I wish Radica had chosen more games with two player modes to put in here and didn’t market it so heavily as a Street Fighter II machine. I’m not a Street Fighter II fan, so the game that I like most in this system doesn’t get top billing, nor does it even get honorable mention (or mentioned at all) until the title screen! Sure these systems aren’t vintage, but the system they’re inspired by and the games they offer are. If nothing more than a fun novelty to own I would collect many more of these systems, had Radica made more. But on the practical side, these are far easier to pack for trips than the real thing.